Platform Specialty Products needed to be cloud-ready, able to scale, and connect their IT users around the world through one global network. They knew connecting anyone to company resources with MPLS did not allow them the flexibility, security, and speed they needed to integrate their merged businesses. 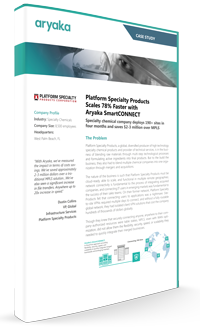 Learn how they utilized Aryaka SmartCONNECT to deploy one global private network for 190+ sites in four months and save $2-3 million annually compared to MPLS. How Platform Specialty Products saved $2 – 3M per year on their global enterprise WAN, compared to the cost of legacy network infrastructure. How to merge disparate networks across the world into one centralized, and fully managed global enterprise network. How Aryaka SmartCONNECT can deploy and enterprise-grade global private network in 78% faster time compared to MPLS.